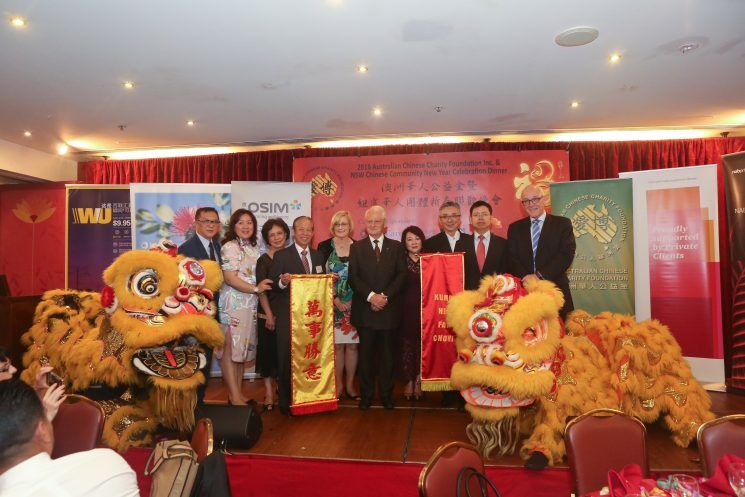 ACCF and the NSW Chinese Community celebrated the year of the Monkey on 13 February at Marigold Restaurant. It was well attended with over 400 guests and community friends. This year the Foundation was most honoured to have our Honorary Patron, His Excellency the Governor of NSW Sir David Hurley AC DSC (Ret’d) and his wife Mrs. Hurley as the event’s guest of honour. Other dignitaries included the Hon. Phillip Ruddock representing the Prime Minister, the Hon. Gladys Berejiklian representing the Premier of NSW, the Hon Ernest Wong MLC representing the NSW leader of Opposition,Mr Luke Foley, Mr Nick Varvaris MP, MrJohn Alexander OAM MP, Mr Damien Tudehope MP, Ms Julia Finn MP , Mr Tong Xuejun Deputy Consul General of PRC in Sydney and Mr Arthur Au, Director of HKETO in Sydney. The beneficiary organisation for the evening was Cure Brain Cancer Foundation.The Foundation was founded by renowned neurosurgeon Prof. Charlie Teo in 2001.Their Mission is to increase five-year survival to 50% by 2023. Supported by the generosity of the guests present at the dinner, $50,000 was raised and presented to Cure Brain Cancer Foundation on 24 March 2016.